Not to much to see or do today, except one PAO event. Just noted a few small errors in the FD -> check the fluid loading table! The Exec Pkg is from STS-122 for some reason. Yeah, just noticed that too after a closer look at the daily schedule and the weather briefing. 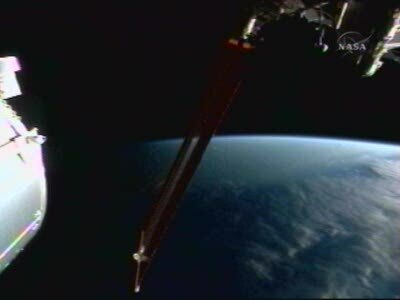 Just for fun I've made a small and short time-lapse movie of orbital sunset from the ISS using the NASA TV feed. A couple of points of interest are the starboard solor array motionless (of course) and movement of radiators (top right). 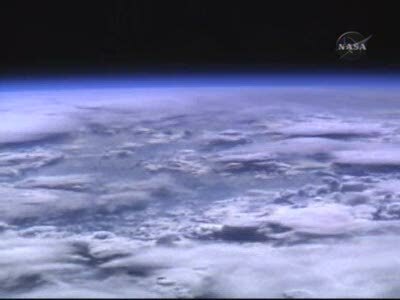 Per L2, Discovery's TPS cleared for re-entry. PAO: Weather promising for Saturday's landing opportunity. (Will add a bit more later, rather than doing a couple of paragraphs, as we've got the Ariane 5 launch tonight, likely a major Constellation article tomorrow, then the landing day article on Saturday). Interesting that ESPN will do an interview. I wonder what they will ask. Mike and Mike are pretty funny so I expect a good-natured interview. Orbit 2 taking over from Orbit 1 in the FCR. Matt Abbott completing his final tour in MCC-H, according to PAO Rob. Sure we wish him all the best. Sorry I couldn't grab a better screenshot. Crew in the final hour of their off duty time, but only have to do routine maintainance and PAO events for the rest of the day. The Landings on Saturday correct?